The second season of Shark Hunters, an NBC Sports series that follows shark hunters around in their boats, is back on the air tonight. Featuring three separate shark fishing tournaments on the East Coast and the captains competing in them, the show is laced with an unpleasant combination of misguided machismo, bloody high-fives and the gleeful killing of sharks. Thrown in for good measure are lame excuses for conservation and "shark science" -- tagging animals with no stated intent for peer-reviewed research. There are so, so many reasons why Shark Hunters is a terrifically bad show -- its low production value notwithstanding. 1. Promoting sharks as "nightmare hunters of the deep" is not only inaccurate, it hurts public perception of sharks. Yes, sharks, like any other carnivorous animals (like humans), eat other animals. This does not mean that they are "nightmare hunters" -- rather, that they are animals that do what animals need to do in order to live. Fearmongering isn't a new idea in the realm of sharks, as anyone who's ever seen "Jaws" can attest. 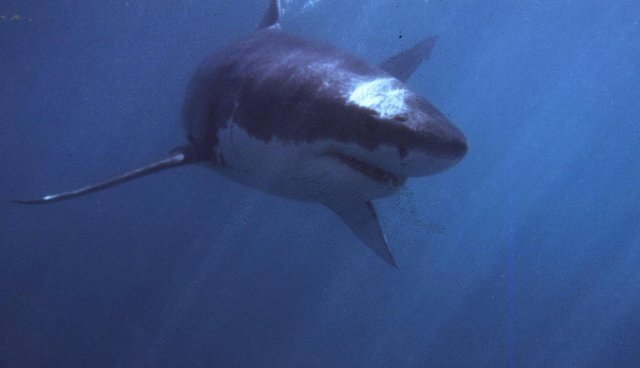 After the 1975 film debuted, shark hunting spiked, and conservationists despaired. In fact the author of the original novel "Jaws," Peter Benchley, expressed regret over portraying sharks as killing machines after he saw the public backlash toward the animals and became a conservationist after its success. "Knowing what I know now, I could never write that book today," Benchley said before his death in 2006. "Sharks don't target human beings, and they certainly don't hold grudges." But "Shark Hunters" is worse than Jaws: people kill real animals instead of mechanical props and the show promotes fear of an animal that is less likely to kill you than a vending machine. 2. The show's conservation claims are flimsy, at best. When "Shark Hunters" premiered last summer, the show touted its claims to conservation and research contributions alongside gory images of sport fishers grinning next to carcasses. In one clip from last year's season, a fisherman says, "conservation is the reason we're out there to catch fish." But, regardless of how many times the words "conservation" and "science" are repeated, that doesn't make what they are doing actual science. Many of the sharks aren't tagged, and there's no information offered about where the data goes to or what kind of conservation they're doing. There's also no educational information about the threats currently facing sharks -- of which trophy hunting is a real and present one. 3. The "conservationists" catch exclusively vulnerable species. Mako sharks, thresher sharks and porbeagle sharks are all listed by the IUCN Red List as vulnerable to extinction -- and are all incredibly ecologically important as apex predators. Funny enough, these are the only three species involved in the Monster Shark Tournament in which the fishermen compete. There are, as the saying goes, a lot of other fish in the sea. But, because of some cruel whim of the gods of fish, the only fish these fishers choose to fish are the ones that might go extinct. 4. The show -- and its participants -- are motivated by money, not conservation. By its very premise, "Shark Hunters" is about a competition for money -- and a lot of it. The winner of one contest stands to waddle home with a $10,000 check weighing his pocket down. And in a press release for last year's season, the boat captains even touted their winnings -- one fisherman alone has won more than $600,000 in tournaments. When shark fishing pays the bills, the incentive to conserve species and not fish shark is astoundingly low. So, despite the perhaps charming, toothless grins of the shark captains and their winsome crew, remember: there are a lot of other fish in the sea and there are a lot of other TV shows, too.